Replacing a tooth that has been lost to trauma or disease is not a quick process. Often the extraction site will need time to heal, and if the tooth is to be replaced with a dental implant, additional procedures such as bone or soft tissue grafts may be required. This can mean going without a permanent replacement tooth for a few weeks or for several months. Obviously this isn’t ideal, particularly as the loss of any tooth can affect the position and stability of those remaining and if the missing tooth is highly visible then its loss can be distressing. Flipper teeth are one solution to this problem. What is a flipper tooth? How much do flipper teeth cost? Who are they for? Adults or kids? A flipper tooth is a removable, lightweight partial denture that is used as a temporary replacement for one or more missing teeth. It fills in any visible gaps so you don’t have to go without a tooth while waiting for a more permanent replacement. A flipper tooth can be constructed before the natural tooth is removed. 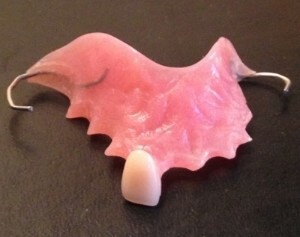 It is made from pink gum-colored denture acrylic that supports the replacement tooth. It may have clasps that fit around existing teeth to help hold it in place. This appliance is easy for the patient to insert and is easily taken out for regular cleaning. A flipper also improves the ability to eat and chew food. Flipper teeth typically cost between $300 and $500. The price depends on the number of teeth that require replacing and the type of materials used and can vary considerably. A flipper that has wire clasps for example, will cost more than one without. They can be used by adults who are missing a single tooth, or who have lost several teeth that are not adjacent to each other. Using flipper teeth can restore the appearance of natural teeth in a way that is immediate and inexpensive. While normally used as a temporary measure, some adults will choose flippers as a more permanent solution for tooth loss. Dentists sometimes recommend flipper teeth for children who may have suffered damage to their front teeth and who are still waiting for their permanent teeth to come through. Wearing them can help restore a child’s self-confidence during this period, which can be an important consideration. They can enable a child with a missing tooth to maintain an appealing and pleasant smile. They are inexpensive to make when compared to other options. This can provide valuable time to save up for more permanent and more expensive restorations such as a dental bridge or a dental implant. They can be used right after natural teeth are removed and are often pre-made prior to tooth removal. They can often be made very quickly, requiring fewer visits to the dentist compared to a more permanent partial denture that may have a metal alloy substructure. They are lightweight and some people find them easy to get used to wearing. They can instantly improve aesthetics, alleviating the embarrassment many people experience when they lose a tooth in a highly visible area in their mouth. The structure of flipper teeth allows some degree of flexibility so if another tooth is lost within the year, the dentist can add this additional tooth to the denture. They are not very strong or stable, which can make it tricky to chew and some people choose to leave their flipper teeth out while eating at home. The metal clasps sometimes used to hold them in place can be difficult to hide, making it more obvious that a person is missing one or more teeth. They are fragile and easily broken. 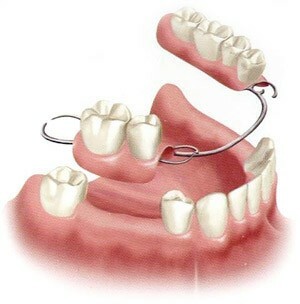 A broken denture can only be mended by a dentist or by a dental laboratory and this may mean going without the flipper for a day or more while it is mended. Frequent breakages could prove increasingly difficult to mend. The overall weakness of the material used to make them does mean that the base of the denture must be quite thick and broad. This additional thickness can make the denture uncomfortable, especially towards the end of the day after a long period of use. The design of a flipper can create unhygienic conditions in the mouth, preventing saliva from having a cleansing effect, particularly on the denture surface closest to the gums. If not meticulously cleaned, flippers can increase the risk of gum disease and tooth decay. After only a short period of use, they can become increasingly ill-fitting and loose. This may mean they are uncomfortable to wear and will rub on the gums, increasing the risk of bone loss in these areas. If you have flipper teeth or are considering getting them, I’d love to hear from you! How much did they cost? Were there any complications? Was it painful? Let me know in the comments. I’ve had my flipper for 5 years because I can’t afford to have the permanent work done. It is difficult to speak clearly with it and keep in for long periods of time. I have to sneak it out of my mouth (and tuck it into my bra or purse) at restaurants, family dinners, picnics, banquets—every time I eat. After my original tooth broke off, I had to have surgery to remove the root of the tooth. Once the gum healed, the flipper tooth no longer touches the gum and there’s a gap. It looks horrible and it’s not fooling anyone. It has broken over a dozen times and I’ve repaired it. Today, my dog got it out of my purse and destroyed it for good. I don’t know what I’m going to do. Just know that flippers are a temporary solution to a permanent problem.